Yes, sometimes I spend a bit more than I should because of my cooking habit. The current wife doesn't help either. I cook...she eats. The circle of life. One of the most expensive ingredients is always butter. Good butter though. Until now: the so called wife found a device that claims to make butter in 3 minutes. She thought it would be a great idea that I make my own. This would be the first step; then the cow, but we'll talk about this in another time. This device comes from a company called Chef'n (I do not a commission not free product...bummer) . The small box claims to make butter in minutes and it claims to included recipes. First I tried the room temperature cream (1 cup) with a Tbsp of honey. Shake it, shake it, shake it baby...3 minutes...4 minutes...5 minutes... then I followed the instructions and poured cold water to get rid of the water and stuff. The cold water took away the whole thing. FAILURE. I trowed as a sign of desperation and... an accident: the wife was on the way and the butter maker hit her head. You could hear screams a block away... it was me running for my life. Hours later and once peace came back home we decided to try with only half a cup and no honey. Just butter. Shake it, shake it... and in exactly 4 minutes the sound of the liquid moving stopped and we did the water cleaning process. Ha!...butter. So, the contraction works. 4 minutes and you get the most expensive butter you can buy (the cost of the cream vs the cost of a bar of butter...), but it is quite good. The butter is soft, great flavor and, as a bonus, you build muscle. The cost is not an issue if you compare it with the cost of growing potatoes in a potato bag. I think each potato is worth about $2.50 each. But the wife likes to play farmer and I am such a pleaser. 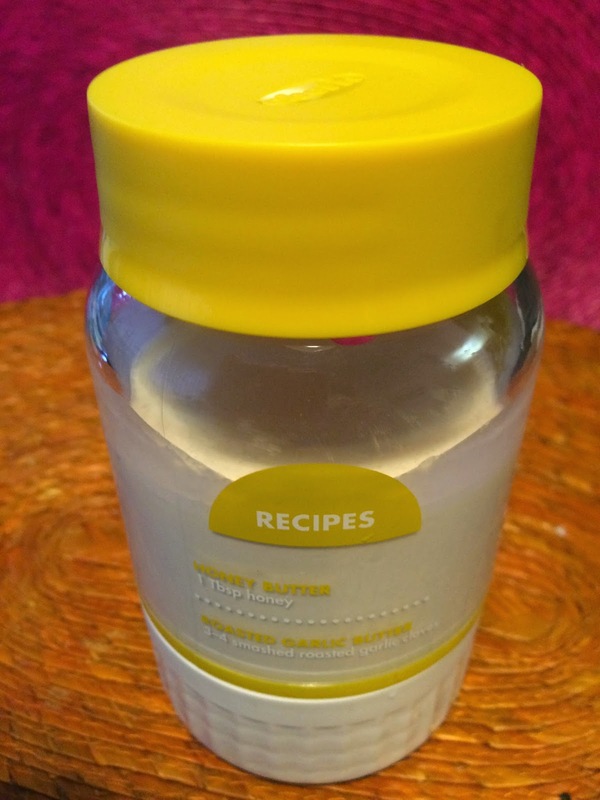 Conclusion: Chef'n butter maker works and delivers great butter, soft and flavorful. The recipes that are "included" are actually two lines printed on a side of the apparatus. That is just a sad marketing scheme and hopefully soon they will fix that and, at least post some on their website. So... who doesn't like ketchup? In any event. Today I learned that H.J. Heinz Company is buying Kraft foods thanks to the street smarts of a Brazilian (yes...Brazilian) investment firm called 3G Capital who owns pretty much half the food brands you use everyday. So... the only solution I can think of is... don't think about it and don't get ripped off by buying something with the phrase "organic", "gluten free" -or the latest craze-, "natural" unless you know better. It would be amazing if I had all the time (and energy) in the world to cook, but that is not the case. Having a full time wife is a lot of work and she gives me no time for those pleasures. Also there is the age and energy factors that limit my ability to do cook as much as I want. But... one thing is having limited time to prepare food and another is to eat whatever. Sometimes easy to prepare recipes is the way to go. 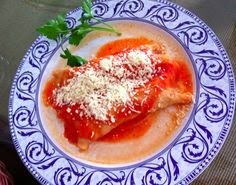 This tomato enchiladas, which are called Entomatadas in México are one of my favorite last minute dishes (and I have to admit that I am the King of Wing (I can wing any meal with any ingredient I have in hand)... so... this is a non-spicy Mexican dish that will make you look that you know what you are doing. The kid that claims to be my son is not a huge fan of this kind of dishes (he rather have some Thai food...ouch!!!!) but, what can I say: I swear he is not mine... probably that is why I call him Sue-she-mean. 1. Cut the tomatoes, garlic and the 1/2 the onion. Blend perfectly . Reserve. 2. 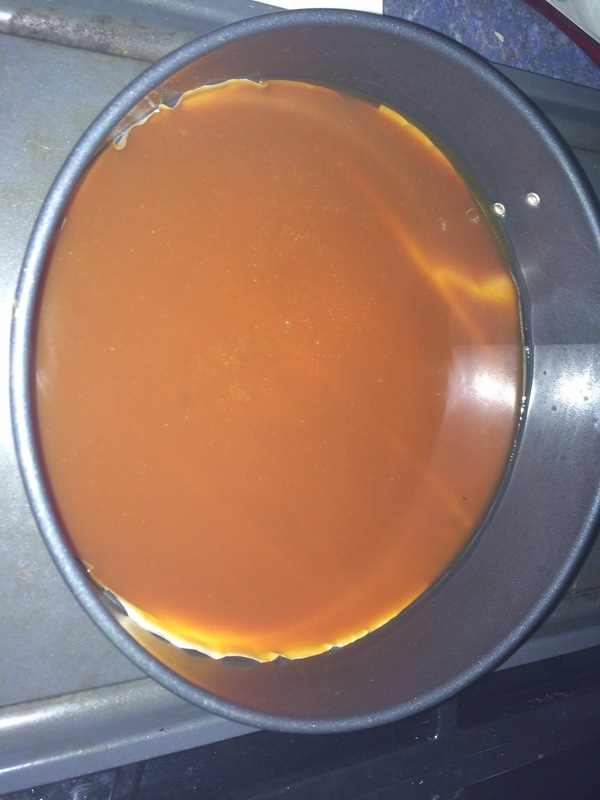 Heat one tablespoon of oil in a frying pan. Once warm, add the tomato mixture and add a cube of chicken -or beef- broth (or your favorite seasoning for a tomato sauce) and cook covered for 30 minutes in LOW heat. Stir occasionally. 3. While the tomato sauce is cooking, we are going to dice the remaining onion. I like to dice it quite small. Reserve. 4. Shred the cheese. Some people like Fortina cheese because it melts wonderfully. I like that one and also I like Manchego or Monterrey Jack cheese. Your choice (please do not use Philadelphia or Blue cheese...). Usually 15o grms. per guest is enough cheese. Reserve. 5. By now the sauce should be ready. Taste it and, if necessary, season a bit more. We should be ready for the final step. 6. Put 3 tablespoons of oil and heat in a frying pan. Medium heat. 7. Warm the corn tortillas (3 at the same time, which is one serving). Once the tortilla is soft we are going to pass them trough the heated oil both sides and place the first fried tortilla on a plate. 7. Stuff the oiled tortilla with some of the diced onion and plenty of cheese. Don't be stingy for crying out loud! 8. Fold and repeat the process 3 times per dish. Stock the tortillas (that should look like a folded quesadilla) nicely on the plate and top with plenty of the tomato sauce. Spread more cheese on top and serve. The cheese on top will melt, otherwise put the plate for 30 seconds in the microwave. 9. Repeat the process 3 more times to get the 4 servings. 10. Garnish with some sliced onion, some cheese. I like to have refried beans with this dish (on a side)... it always works. * You can also stuff the entomatadas with shredded chicken or pulled pork and the end result will be as good as with the ones with cheese. Somehow the cake classics are always a triumph! 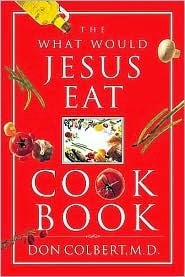 As much as I love to try new and more challenging recipes, some days my heart calls for a classic. 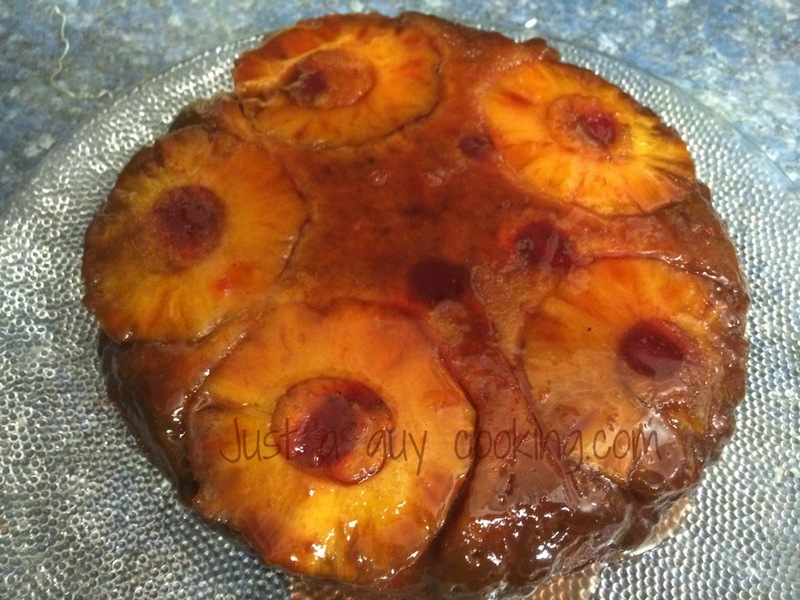 Upside-down pineapple cake is one of those. Amazes me how people recognizes the flavor and the name and they assume that it must be a piece of cake (ha!) to prepare it.... because their mom used to bake it often and... well... she was not the greatest cook on Earth. This is not the case. Upside-down cakes are a classic that can be altered if you know what is what you are looking for. I have seen many many recipes and most of them differ somehow (sometimes on the ingredients, sometime on the proportions and sometimes differ completely). The other version that I want to bake next time is the cast iron-stove version. Also in my to try list is one made with plantain (mucho Mexicano cake as they say where I live). I know that the cake is a success when the current wife stops talking to me -which can be a good thing-. She claims that it is my fault that she eats it all... my argument is that she should have a stronger will and just eat a bit at the time, but no!, she wants it all. Last time as soon as she saw a new cake I made... she went to the kitchen, got a fork and eat it all while watching Inspector Brunetti, her favorite German spoken Italian detective show. When I tried to get a piece she threatened me with the fork and a knife she keeps in her drawer -somehow-... so I decided that my life was worth more than the cake. Next day she was upset because I let her eat all that much. In any event, here is the cake. Some recipes call for canned pineapple (I believe that the recipe became popular when canned pineapple was made available as way back then we just couldn't buy anything we wanted year round). I like the idea... if you live in the 1920's. Go and buy a fresh pineapple and do the right thing. There is nothing like fresh fruit. Line the bottom of a 9 inch springform pan with parchment paper and butter the wall of the pan with butter. Place the pan on a cookie sheet. 5. Remove from heat and let the pineapples slices cool in the syrup. Reserve. 7. Remove from the heat and slowly add the cream while stirring with a wooden spoon (it will bubble and foam like crazy!! !… fast…be careful). Don't say I did not warn you: it will foam!!! 8. Return to burner, medium heat, and add vanilla and salt and continue to whisk until smooth. Remove from heat and allow it to cool. Reserve. 10. Arrange pineapple slices in bottom of the pan, placing them on top of the caramel and place a maraschino cherry in the center of each pineapple ring. 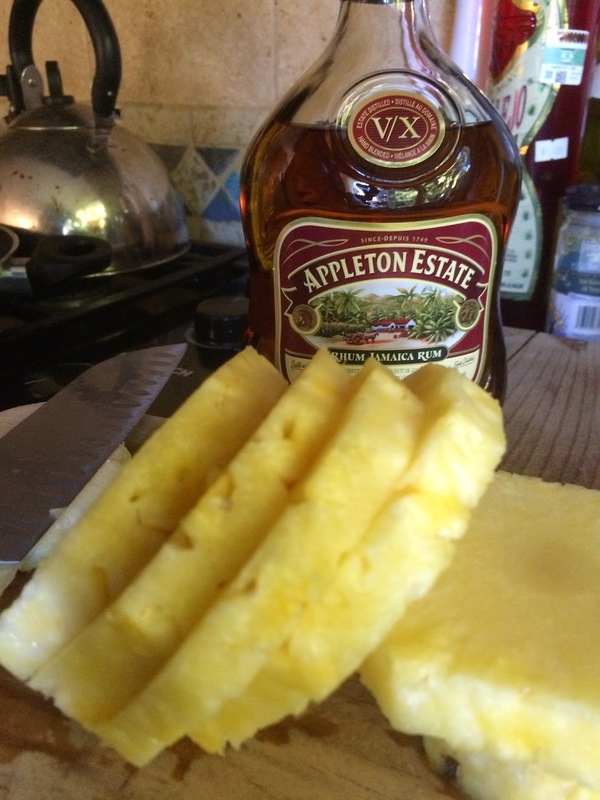 Reserve the syrup where the pineapples were!…we’ll use it later. 11. Preheat the oven to 350˚F. 12. Now let’s prepare the batter: place the butter in the bowl of a standard mixer and beat until is light, fluffy and clear color. Add the eggs, one at the time and keep beating until incorporated. No mixer?...no problem... grease elbow time ! 12. In a separate bowl we are going to mix our dry ingredients: the sifted four, baking powder and salt. 13. Add the dry ingredient mix alternately with the reserved pineapple syrup and the yogurt and beat until smooth. 14. Spread the cake batter over the pineapple slices and place the pan (that is on top of the baking sheet…just in case the caramel leaks) into the oven and bake for approximately 45 minutes or until a toothpick is inserted and it comes out clean. Don't worry if it takes longer...patience is the key... not all ovens are born the same. 15. Remove from the oven and let it cool in pan for 15 minutes, then run a plastic knife and loosen the springform gently. Then, carefully remove the bottom of the pan along with the parchment paper (oh… of course…you have to turn the cake upside-down first so the pineapple part is facing up) and allow it to cool for another 15 minutes. 16. Finish the cake by pouring the leftover syrup, if you have any, on top of the pineapple slices. Then serve warm…or cold.